If you need to make a lot of corn on the cob super fast, throw the corn into the cooler and pour boiling water over the corn. Close the lid and wait 30 minutes. When you come back you will have soft, sweet corn for the table. Fruit salad, Caesar salad, or whatever salad you have will be better served in a large glass jar. This will keep out bugs, and still show off the beauty of the fruits and vegetables inside. Nothing kills a party like running out of gas for the grill. 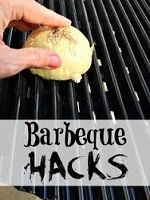 Luckily, even if you don’t have a scale, you can get a good idea of how much propane’s left with this trick. Simply pour some hot water down the side of your tank. Where there’s propane, it will feel cold; where it’s empty, it will feel warm.